I was a little bored the other night, so had to experiment a little bit. The cupcakes are yellow cake, with a spoonful of Nutella in the middle. Very easy to make and so yummy. 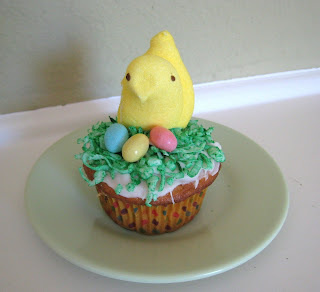 They're topped with white icing, dyed green coconut "grass", jelly bean eggs and little Peep chickies! The kids are loving them, and I think they are too cute. Adorable!! We just might have to make some chickiecakes over here.